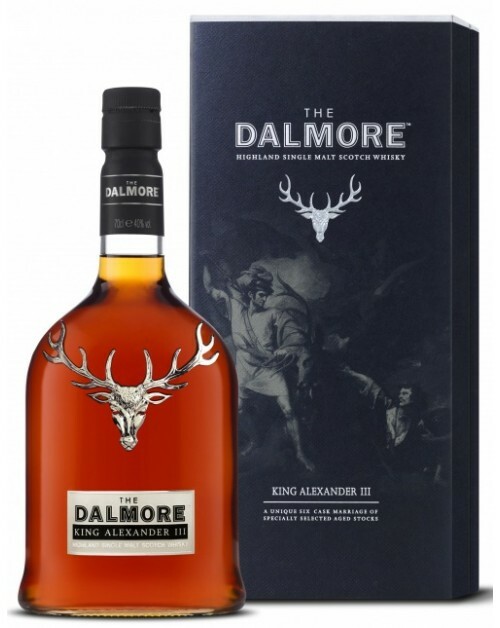 Dalmore King Alexander III Single Malt Whisky; a regally named expression which unites six specially selected casks housing spirit of perfect maturity. The maturing casks are; Cabernet Sauvignon, Madeira, Sherry, Marsala, Kentucky Bourbon and Port pipes. Each cask gives its own flavour notes, delivering a unique complex single malt Whisky revered by connoisseurs. It is a rich, fruity Highland single malt. Nose: Malty with an orange zest, barley and chocolate. Creamy vanilla fudge with tropical fruit. Palate: Medium and rounded. Winter berries, spice and zesty orange. Finish: Peppery with mingled oak and a late appearing claret.